Today Karen and Chris have been busy all morning, first with monitoring the approach of HTV-Kounotori 4 – the “White Stork” that brings us Japanese supplies, experiments and materials – then with its capture, performed with grace and skill by Karen. As I wrote upon the arrival of ATV-4, the arrival of a cargo vehicle is always exciting. Unlike the cargo ships that automatically dock to the Russian segment, those of the American segment are ‘captured’ by the Canadarm2, which is controlled by an operator. So far, the Japanese freight vehicles have been very stable but the capture operation is still extremely delicate and many hours of training are devoted to resolving potentially disastrous situations. Another difference is that the approach can be followed live from Cupola, which is also where we control the capture from. It is an event with its own particular beauty, which I would describe as ‘elegantly technological’. Kounotori shines as the sunlight reflects on its golden surfaces: it doesn’t have ‘wings’ like ATV but it is a similar size and while it slowly approaches, I can’t help but stand and watch in amazement at this giant machine that moves in such a well-controlled and precise manner. I watch the arrhythmic jets of gas fire from the engine nozzles and HTV begins to rotate to align itself for the docking manoeuver, now just a few meters away from the robotic arm that is ready and waiting. This silent choreography, despite its simplicity, is thrilling. Looking at the monitor, HTV appears perfectly still through the camera mounted on Canadarm2. Karen receives authorization to capture, begins the approach and asks Chris to set the ‘free drift’ command for HTV: from now on, any rotation or movement will no longer be corrected by the engines. 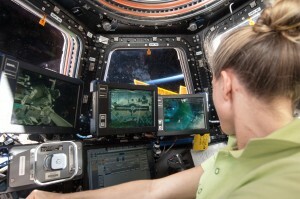 For 99 long seconds Karen deftly guides the robotic arm and once in position, she presses the ‘trigger’ that activates the mechanical system linking the cargo ship’s interface to Canadarm2. Everything happens with precision and the silence is broken only by the communication time and distance punctuated by Chris and Karen’s answers. Chris reads the parameters and calmly confirms the capture of HTV4: the stork has reached its destination and is ready to deliver its ‘bundle’. Yesterday the ground controllers ‘hooked’ HTV4 up to the station and now it’s down to me and Karen to do the work needed to open the hatch. The process of equalization and reconfiguration is long and complex and it takes us the entire morning to complete it. But when ground control switch the lights on and we get our first glimpse of the immaculate interior of the cargo vehicle through the hatch, an inevitable smile lights up Karen’s face and I’m sure a similar one is printed on my face too. Next, it’s time to open the hatch: I feel really honoured when Chris and Karen tell me to go ahead – a little gift for the ‘younger brother’. Equipped with personal protective gear (mask and goggles, just in case there’s any dust in the HTV’s atmosphere) I execute the procedure: I open the door and lower myself inside the pressurized module. The portable analyser confirms that there are no contaminants in the atmosphere: the rest of the crew can safely enter. 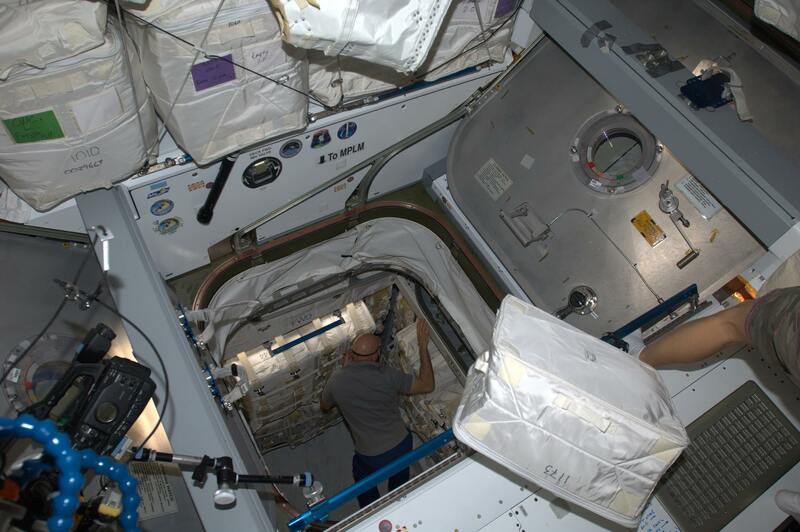 In the afternoon Chris is tasked with starting to open HTV’s cargo. The ‘choreography’ sent to us from the ground details the exact order for opening each container and where the material should be put in the Station. But the first container is special: it contains gifts from our families – all in just a few cubic centimetres but full of the memories, flavours, colours and smells of our planet. With the same quivering anticipation of a child who is about to open the biggest present on his birthday, one by one I open the packages that my wife Kathy has carefully prepared. With a smile that just keeps growing, I find individual packs of green chilli, a speciality of New Mexico that makes even the blandest meals tasty. Kathy has shipped them in industrial quantities, and there will be enough for everyone, both for this expedition and for the next! Then there are a few cans of a popular hazelnut paste – I don’t normally have a sweet tooth but this very Italian speciality tastes of my childhood, and I’m already thinking about my future breakfasts… Then I find some books that I recognize immediately because I’ve read them dozens of times: full of colours and imagination, I’ve told these stories time and again to my daughters when they were tucked up in bed, my voice keeping them company as they drifted off to sleep. But, as always, it is the last parcel that instantly whisks me away from this ship and transports me back to Earth in a flurry of emotions that almost overwhelms me, bringing tears to my eyes. Folded inside a simple plastic bag are some colourful pieces of cloth: two squares as big as handkerchiefs, cut from my daughters’ blankets. They are soft and fragrant; I hold them up to my face and lose myself in the sweet, unique, unmistakable scent of my daughters. I can almost feel the warmth of their embrace and I let myself be wrapped up in the tenderness felt by a father through the love of his daughters. I love your blogs! Your descriptive writing talents make me feel like I am right in there with the crew. The part about your daughter’s’ blankets brought bittersweet tears to my eyes. I have 2 daughters, so I know of that sweet smell of love that your nose captured! Thank you for sharing! Sei straordinario, anche nello scrivere e nel trasmettere le tue emozioni, ci hai commosso!!!!! Mancherai sicuramente tantissimo anche a loro!!!! Spero che il nostro calore e il nostro affetto possa placare un pò della tua nostalgia…un abbraccio da tutti noi siciliani!!!! Oltre alla tua professione, è evidente che ti piace molto scrivere e soprattutto descrivere ciò che vedi e che senti dentro. Non perdere di vista questa ‘natura’ interiore che molti come me sicuramente percepiscono. La lettura quando diventa partecipata, diventa un’emozione viva anche per chi legge e aiuta molto, fa battere il cuore, rende vivi e ti fa sentire parte di qualcosa. Penso che dovresti, insieme al team, creare una sorta di diario ‘umano’ (nel senso non troppo tecnico), come queste pagine che scrivi e ci rendi partecipi, raccogliere il tutto e una volta tornato sul pianeta terra pubblicarlo immagini e scritti. Sarà memoria storica per voi e per tutti noi, inoltre avrete la possibilità di avvicinare anche dei ragazzi a questa professione fin da bambini e continuare a far sognare molte altre persone che avendo questo libro nella propria libreria, diranno “io ricordo di aver visto quella scia nel cielo! gli ho scritto, mi ha risposto! è stato così umano! è stato bello!” non lo so… magari sono impressioni errate le mie… ma una possibile vostra scrittura la vedo come un bene per chi come me ha una stanza piena di libri e ritrova pace leggendo 🙂 Saluti, Kate. Penso che sia pesante la lontananza , deve essere incredibile per loro attendere il passaggio di quel puntino in cielo che ti porta in giro (!) …è un’emozione per noi che semplicemente ti conosciamo per questa impresa….ma la tua famiglia è fortunata ad avere una persona così sensibile come te …è tu d’altro canto sei fortunato ad avere loro che ti danno questa stabilità di sentimenti…buona continuazione e un abbraccio virtuale grande-grande che ti avvolge insieme ai tuoi cari. L’anima sensibile è solo di un grande uomo: Luca Parmitano. Apro fb e trovo questo tuo nuovo scritto. Un uomo determinato, che sa quello che vuole, diremmo con le p…. :), ma che non ha paura di esprimere e condividere i propri sentimenti e le emozioni. Mentre nel mondo sembra tutto cadere nel caos, ci sono persone meravigliose che, con la loro semplicità, sanno indicare la via, la speranza. Buona continuazione Luca, saluto te con tanto affetto, insieme alle splendide persone che condividono con te questa avventura, a partire dalla tua famiglia. Un forte abbraccio . Piango. Che novità, eh? Il problema sarà digitare con la vista annebbiata. Mi ero già emozionata vedendo la vostra foto, ancora prima di leggere. E’ inutile, è più forte di me. Mi era già capitato vedendo la meravigliosa foto di voi 4 che hanno passato al TG1… adoro vederti felice. :’) Sai, ce n’è un’altra, di te con le tue 2 stelline, che non posso guardare altrimenti apro i rubinetti. E’ quella l’immagine che mi viene in mente quando penso “Luca, il suo cuore e la felicità”, da quella foto trapela un amore infinito, che mi commuove ogni volta. Leggo sempre con piacere e a ttenzione i tuoi commenti. Solo una parola: grazie. tra breve avremo la visita del Papa. da dedicqre a tutta la zona del medio campidano? un piccolo incoraggiamento di due righe. Te ne saremo tutti molto grati. Leggerti è ogni volta un’autentico piacere. Te lo ripeto scrivi veramente bene, mixando cervello, cuore e informazioni tecniche. In questo tuo scritto sono i particolari quelli che colpiscono maggiormente. L’accurata descrizione della ” Bianca Cicogna” e l’eleganza discreta e raffinata della tecnologia. Il concetto è perfetto, perchè anche la tecnologia può creare eleganti scenografie e anche coreografie. Provo ad immaginare la bellezza della scena e a sentirne le note musicali nel silenzio dello Spazio. Pio mi piace la tua definizione di “Fratello minore” così come mi piace la assoluta precisione sia professionale che tecnica impiegata dei colleghi Karen e Chris. Mi piacciono i “regali” dei familiari che arrivano per voi dalla Terra e mi piace immaginare il tuo volto e quello di Karen pieni di stupore, simile a quello dei bambini davanti ai regali speciali ricevuti in occasioni speciali. Poi mi piace la premura eccessiva , ma proprio per questo amorevole di tua moglie che ti invia grandi quantità di cose buone dalla Terra! Poi ancora pezzetti delle coperte delle tue bimbe, questo pensiero è tenerissimo, ma il podio io personalmente lo assegno ai libri letti decine volte insieme alle tue figlie. Questo è e vale oro, sia per te che per loro, ne sono certa. Infine la bella immagine della tua famiglia prima della partenza, la prima volta che l’ho vista mi è rimbalzata una emozione dentro, perchè mi sono rivista bambina, accanto ai miei genitori e al mio babbo che mi sembrava grande e importante e mi sembrava così perchè lo era, perchè era il mio babbo. Luca, your blog is beautiful. You have a wonderful gift with words and I almost felt that I was in the ISS with you as you opened those special parcels. I’m sure that your girls are cuddling something that reminds them of their daddy. Your wife must be a very special lady too. Thank you Luca, from Fran in Cardiff. Hope you and your crew enjoyed the package they sent. till you guys come back to earth. May God bless you all! I watched the capture of HTV4 (R2D2). I agree with you. It was technologically elegant. That was so amazing. Karen and Chris did an awesome job catching it. 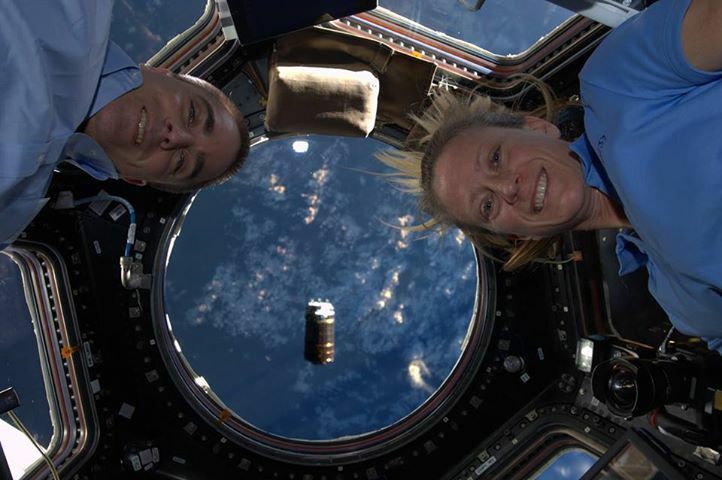 I absolutely love that photo you took of Karen and Chris with HTV4 in the cupola window with earth behind it. They have the best smiles ever in that photo. You have a beautiful family. Your wife, Kathy, looks like a model. She is so pretty. Your little girls are adorable. And you have a gift for writing! That last paragraph was especially wonderfully written. I felt it. 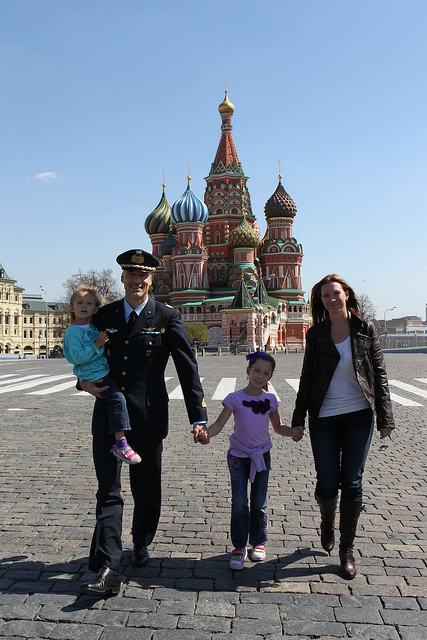 It won’t be long and you will be back home with your loved ones! Nice of your family to send up such a wonderful care package. If you all eat that green chili you will have steam coming out of your ears; enough to propel the ISS! LOL Also you will have to read those stories from space on video for your girls. I bet they would like that ! My 9 1/2 month mission (so to speak) starts Monday. Like you, I get to unpack! I will unpack my classroom in a box (in this case many boxes) and put all the items where they go. I am very excited to see my special needs students again. I teach cognitively impaired non verbal and limited verbal students on the autism spectrum ages 13 to 26 and it is going to be a great year! Thanks for sharing your experiences! Godspeed! Thank you Lorna. Thank you for making the world a better place one person at a time. Luca; sigo con deleite fotos y relatos tuyos, como hipnotizada. Con exquisita sencillez has logrado tender un màgico puente – lleno de sentimientos – entre el espacio y la tierra!!. No cualquiera lo logra!!! Gracias..gracias..gracias! Era la mia curiosità maggiore. Al di là della tecnologia, della scienza c’è l’uomo, con tutte le sue fragilità, emozioni, paure, sentimenti. Stare lontano dai propri cari per così tanto tempo deve essere la parte più difficile di questo viaggio. Sei un professionista, lo sai che sarà così, sei addestrato per farlo, ma quando oggetti del tuo quotidiano vivere riportano il cuore a casa devi essere veramente forte e motivato per stare lassù. Chiedo scusa,dicevo buongiorno. Riflettevo ammirando le fotografie che Lei ci invia dallo spazio. La definizione che mi fanno venire è in mente è UNICHE. Si perchè per poter cogliere la bellezza del nostro pianeta nella sua intierezza l’unico modo è quello di staccarsi dalla Terra. Unico è anche Lei perchè è grazie alla sua sensibiltà che riesce a trasferire a noi che viviamo ancorati alla forza di gravità le sensazioni che lassù il nostro pianeta azzurro trasmette. Unica è anche la possibilità che voi astronauti avete di fornirci la prova inconfutabile di una verità mai scontata quanto semplice. La Terra è una sola indivisibile madre compassionevole che consentirebbe ad ogni singolo individuo di vivere felicemente. Se si riuscisse a cogliere l’unicità composta dalle singole differenze di ogni essere umano che Voi lassù osservate il mondo avrebbe delle possibiltà di un futuro migliore. E allora la prego mi aiuti, aiuti tutti noi che facciamo parte di un ‘umanità meravigliosa ma ancora miope a guardare lontano dalle nostre piccole visioni errate che ci fanno credere ancora che eliminare altri esseri umani sia la soluzione ai propri problemi. Il mondo unico, bello e insostituibile merita finalmente di essere visto per quello che è e non più come un campo di battaglie fra fratelli che hanno come differenze, solo sfumature. Grazie. Ancora una volta riesci ad emozionarci! Grazie ormai aspetto ogni volta con ansia il tuo post. Sai io non leggo libri perché non ho la passione per la lettura ma ogni volta che leggo un tuo post mi appassiono sempre di più nel leggere perché tu riesci a trasmettere i tuoi sentimenti in modo così naturale! Grazie ancora perché riesci sempre a rendere le cose straordinarie molto ordinarie e quindi alla portata di tutti . Grazie ancora e buona navigazione!!! Semplicemente emozionante e commovente leggerti! un ancora di speranza per quello che sarà di me. ieri sera ti ho visto perfettamente passare sopra la mia testa.. mi ha emozionato pensarti lì.. e non era la prima volta che ti vedevo.. Mio figlio ha detto che se non gli avessi spiegato avrebbe pensato agli alieni!!! ma leggendo i tuoi post sei (siete) tutto fuorché alieni, nonostante siate addestrati a fare gli astronauti. Siete delle belle persone e sono fiero di “conoscerti”, di poter comunicare con te via twitter, di leggere le tue parole e condividere le tue emozioni. I’m very touched by your beauty. Such a pleasure to read poetry and science dancing as one. Sei un Grande. Capace di farci sognare,vivere emozioni inimmaginabili prima d’ora. Ogni qualvolta l’orbita del’ISS ci permette di incontrarti (anche se solo con un puntino luminoso) stiamo tutti con il naso all’insù . Ma quando scrivi le tue emozioni, quando ci parli delle tue bimbe , della tua Famiglia,rendi magico il mondo! Ma dov’eri nascosto? La terra ha bisogno di uomini come Te, che pur consapevole di avere un grande ruolo mantieni un profilo basso consapevole della grandezza del Creato e della minuscola dimensione dell’uomo nel Creato. Buona navigazione e che Dio vi assista assieme ai tuoi compagni d’Avventura. Ci affascini con la semplicità delle tue parole, e con le stesse ci emozioni e ci commuovi! Uno spaccato di vita “spazialmente” quotidiana dal quale la straordinarietà che io intuisco, l’essere supereroi, si “riduce” alla normalità dell’essere umano. E ci accorgiamo così che le cose più importanti sono le più semplici. P.S. The 9 1/2 months refers to the length of time students attend school during the year here. Here in the USA public education starts in September and ends mid June unless you live in California. School is year round in California with different vacation times during the year. The mission I was speaking of was my teaching mission. I am so pleased to be able to follow what you do in your blogs. You have a beautiful way with words. I love reading your work. Enjoy your gifts! c’è ancora un pacchetto per te, è blu con il fiocco bianco ; virtuale, ma spero gradito. Dentro la scatola trovi 3 medaglie d’oro, cioccolattini e fiori di zagara. Motivazione : straziante pagina quella scritta dallo spazio da Luca Parmitano, il 23 agosto 2013 . L’immagine della sublime commozione dell’uomo “disceso sulla terra e accanto al calore delle sue bimbe” ha investito tutti noi di una dolcezza indescrivibile e di un dirompente pianto !!! 3 medaglie: una per il grande astronauta, l’altra per il grande uomo e un’altra per il grandissimo papà . Atri 2 pacchetti blu sono per Karen e Chris, pieni di medaglie e delizie! Grazie per il lavoro che state svolgendo.!!! Grazie per tutte le emozioni che ci trasmetti. Sei una gran bella persona che riveste un ruolo importante dove la qualità maggiore è una grande intelligenza……ma il tutto avvolto da una grande umiltà ed è questo che ti rende ammirevole agli occhi di noi tutti. Grazie ancora di condividere con noi il tuo viaggio. Ciao Luca è veramente appassionante il modo in cui scrivi! Da brivido, riesci a far trasparire le sensazioni e le emozioni attraverso il mio piccolo schermo, nn posso piu fare a meno di guardare il cielo ed immaginare le vostre avventure nello spazio. Grazie mille di condividere con noi la tua esperienza! Hello Luca, you have a gift for writing with words that evoke taste and smell. I could see and understand the docking procedure, your words are clear and concise, I could almost see the manoeuvre of the arm and inside the HTV 4. Thank you for the opportunity. Ciao mio fratello, così bello leggere le tue parole. Ora tutto il mio mascara è sulle mie guance! Non un occhio secco in casa mia! Le tue ragazze devono pensare a te adesso ogni volta che vanno a tenere un angolo della loro coperte. 🙂 Meraviglioso per leggere il tuo blog e sapere che ti verrà a mangiare peperoncino verde lungo con il resto di noi in New Mexico. Ho una domanda per voi? Sei in grado di bere vino nello spazio? Che cosa è come in assenza di gravità? Ciao Luca, i tuoi raconti e le tue foto sono quanto di meglio che un appassionato di fantascienza possa vivere ai giorni nostri. Grazie per farci vivere questa realtà per farci sognare ogni volta che vediamo un tuo post! sempre emozionante leggerti, ogni tanto vedere il puntino luminoso passare sopra le nostre teste o avere il piacere di ascoltare la tua voce in radio. Complimenti per il tuo modo di scrivere e descrivere le tue sensazioni, non so se ancora non ci hai pensato, ma raccogliendo il meglio del blog e con qualche aggiunta, io al posto tuo, un libro lo scriverei. @astro_luca tu insieme ad altri due componeti della iSS ritornerete a metà novembre. altri tre prima di voi . quando? ho sempre pensato che ognuno ha una favola dentro, che non riesce a leggere da solo. Tu, giorno dopo giorno, foto dopo foto, commento dopo commento ci stai raccontando una favola bellissima, rara ed emozionante, in cui siamo tutti protagonisti. Questa è la tua magia. E come diceva un tuo ” precursore” :…è il tempo che hai perduto per la tua rosa che ha fatto la tua rosa così importante…( Petit Prince). Partivo per trovare, non per perdere. Per un distacco che è il gesto necessario di chi ha bisogno di riconoscere, riconoscersi. Per mettere a fuoco una distanza e guardare attraverso di essa, finalmente. Andare il più lontano possibile, ma per tornare. Di sicuro a muovere tutto ciò che fai è una grande passione. Traspare da ogni aggettivo che usi, dai particolari che ci racconti, dallo sguardo sempre attento a mettere in evidenza le circostanze straordinarie che stai vivendo. Passione per ciò che vivi, ma anche per ciò in cui credi e per ció che vivrai. Come un fanciullo la tua voglia di raccontare le tue sensazioni, le tue emozioni ed i tuoi ragionamenti, coinvolge e ci rende presenti lì con te. La meraviglia che mostri nei confronti dell’esperienza che stai vivendo, e l’umiltà con la quale ti poni nei confronti del mondo intero ti fa onore e ti rende unico …. E quei due quadratini di stoffa colorata dimostrano, come se ce ne fosse di nuovo bisogno, che Luca Parmitano è, fondamentalmente, un Uomo. Good day, you speak from the heart Luca and the words resonate with all who read them. I will always have the picture in my mind of the twirling ballet dancer among green dancing peas! Toooooo funny! Luca, sei un grande, grande uomo! Scrivo questo dal capezzale di mio padre novantenne, che grazie a Dio sta migliorando. Grazie a te, dopo tre giorni, le lacrime che mi scendono copiose sono solo di felicità. Al prossimo passaggio della ISS, buon lavoro. Hola luca!! Desde argentina te saludo sos un gran hombre felicitaciones!! Ti ho scoperto solo ora. Ho letto commenti entusiasmanti. Ti seguirò compassione. Sei l’orgoglio per noi italiani onesti. Quaggiù un pregiudicato sta condizionando la vita di tutti gli italiani! È una cosa avvilente! Auguri per il prosieguo della tua missione. Ti ho scoperto solo ora. Ho letto commenti entusiasmanti. Ti seguirò con passione. Sei l’orgoglio per noi italiani onesti. Quaggiù un pregiudicato sta condizionando la vita di tutti gli italiani! È una cosa avvilente! Auguri per il prosieguo della tua missione.